Allows installation of electronic 19" equipment (including computers) indoors on the wall. 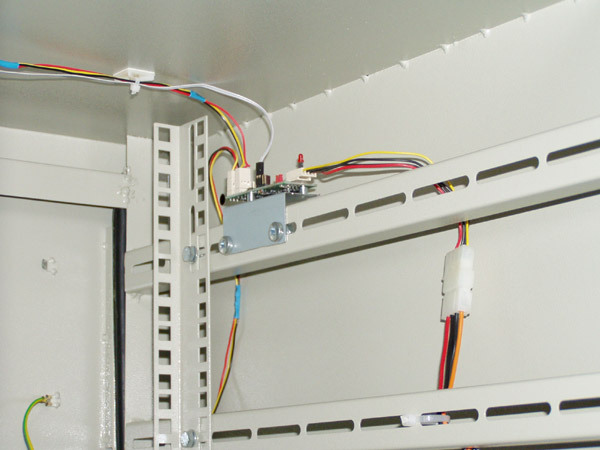 The cooling system provides correct air circulation due to delivering fresh air by DC fans controlled by FanMagic®. The FanMagic controller is supplied from one of the computers to be installed in cabinet (or from AC/DC adapter). 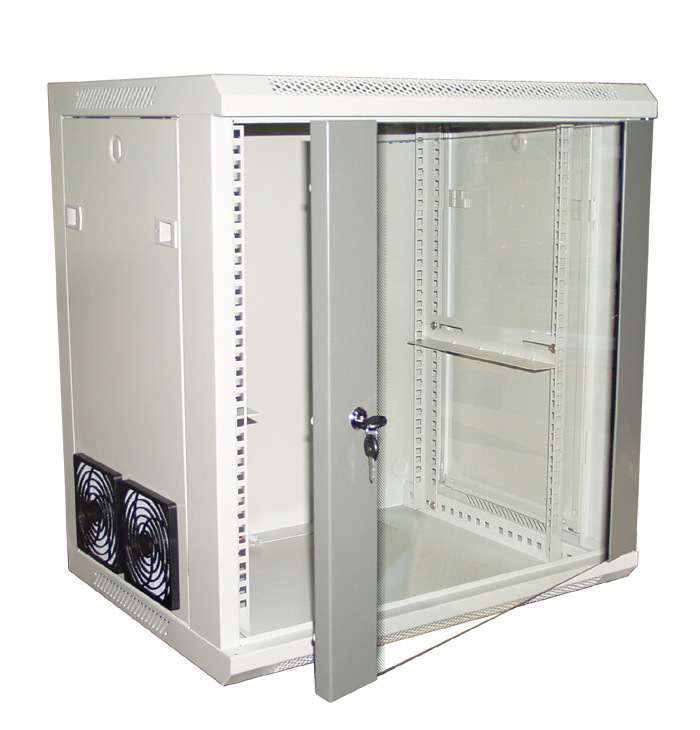 The airflow is controlled depending on inner temperature. The fans positions and their quantity and dimentions depend on operation conditions and are subject to coordinate. 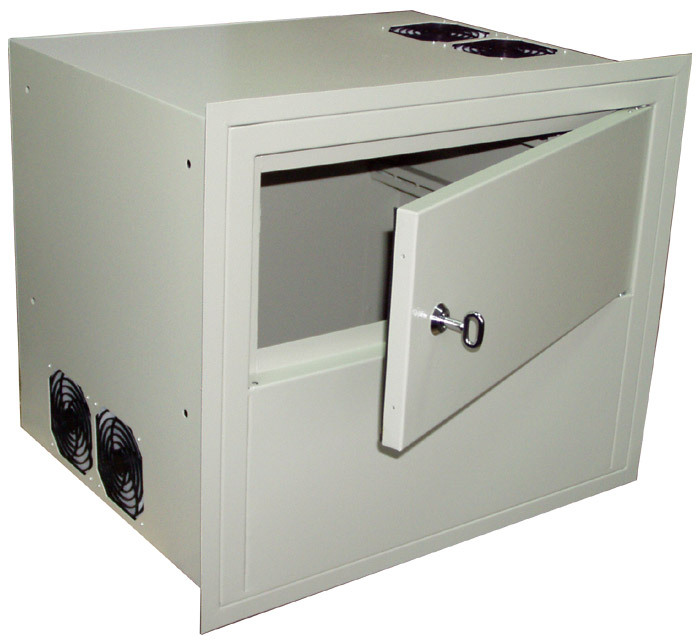 The fans with air filters and redundant air pressure provide effective dust protection. Hot air quits the chassis through ventilation holes and splits. - Mounting positions: left/right. User hinged on the left or the right hand side. 4x 80x80x25 2500RPM, 3.72м3/min total air flow. All fans equipted with air filters. 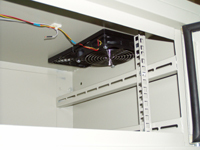 Inflow fans at the base of the cabinet provide the most effective air circulation. There is a cable to supply FanMagic controller from chassis PSU to be installed. 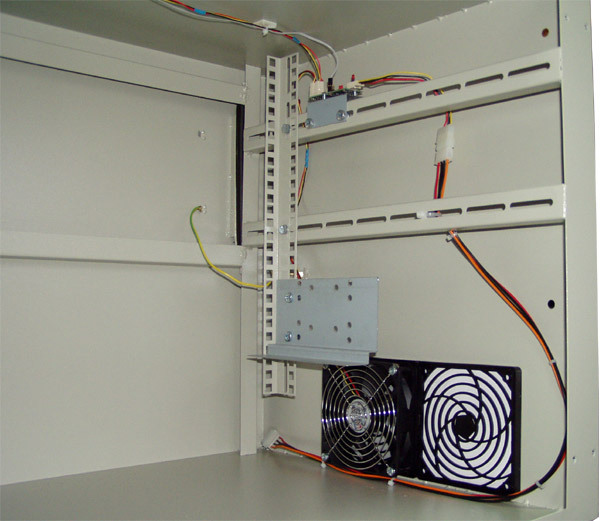 Cabinet with installed DS15, DS35 chassis. You can see two racks, door ground wire. Allows installation of electronic 19" equipment (including computers) indoors. When building in wall you have to provide the cabinet with good ventilation. The ventilation holes are at the side and at the top. The air circulation is enforced by two DC cooling fans with speed control (one to the inflow and the other to the outflow). 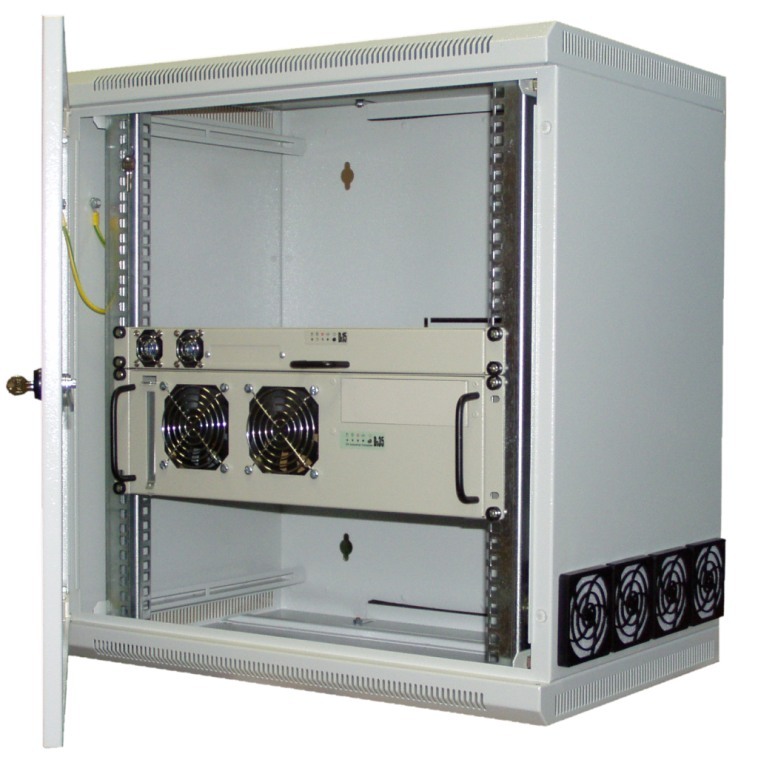 Both fans are equipted with air filters which prevent cabinet from dust penetration. 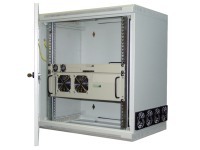 The airflow volume sets in depending on cabinet inner temperature. 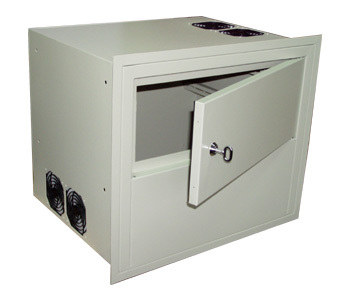 The cabinet consists of a welded body and a metal door of half cabinet height with tubular rubber gasket. Rear panel is attached to the cabinet by four screws. 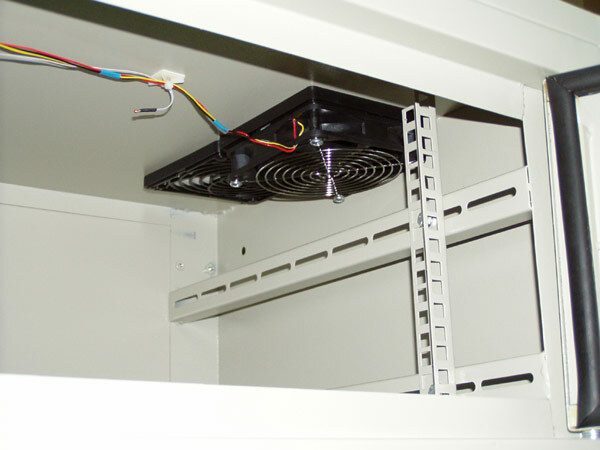 Fan filters can be fastened inside the cabinet (flush-mounted), as shown on the photos, to be served from inside (including changing fans) or outside, to make it easier to attach to air ducts, only when they will be accessible for service from outside. - 2x 120x120x25 2400RPM fans (one to inflow and the other to outflow), 2.36m3/min total controlled by intelligent cooling system FanMagic®. Photo with rear panel taken off, we can see fans speed controller - FanMagic®. The inflow provides by the fan on the base, that supply fresh air. 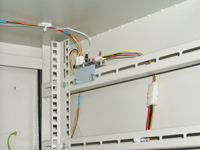 You can see a cable to supply FanMagic® controller from chassis to be installed, rack fastening system, door ground wire. The view through the door. You can see the autflow fan, temperature remote sensor fastened at the top, door tubular rubber gasket.